Hello Everyone. Today’s photo challenge is “The Natural World”. And my world today is freezing cold. 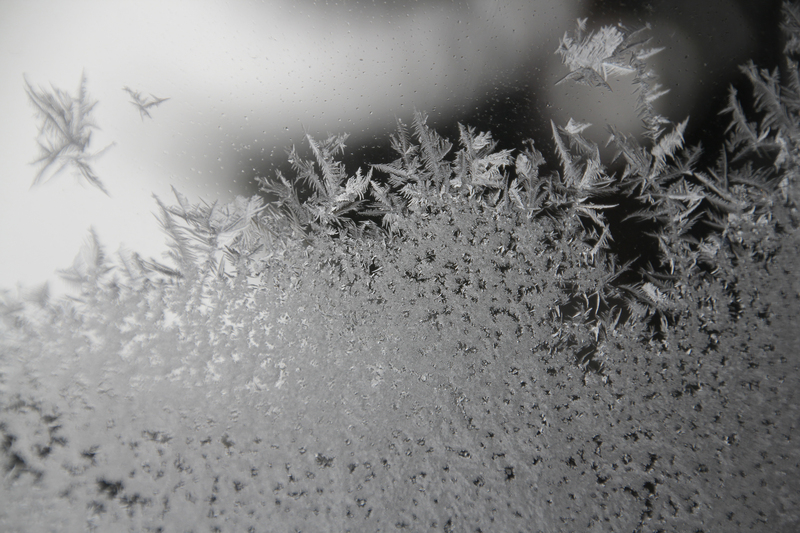 I grabbed this photo of frost on the window in my quilt studio. The darkness you see in the back are the trees off in the distance. I just love the intricacy of lines and patterns in the image. It’s also very cool, how the leading edge seems to be in a curve each time. I love the intricate snowflakes on your frozen quilt! What a great metaphor. Thanks Julie! WOW! That’s beautiful! I’m in Southern California and only can dream of frost! Thank you. I am finding this Photo101 to be inspiring me to use my camera much more. I have always been fascinated by the little details around me. Well you sure got some potential…. 🙂 Looking forward to seeing more photographs. Thanks Donna! Have you been busy quilting? I sure have! Recently, spent one whole day for Project Linus making receiving blankets for hospitals. http://projectlinuskc.webs.com/apps/photos/ and on the others days of my week, I quilt about 4 hours a day. Going to try your link to Bonnie Hunter’s scrappy. Also working on kids’ anniversary quilt (2 yrs in the making), my niece’s large quilt, and a thank you small quilt in Batiks. Such fun I am having in my retirement as DH reads away. LOL Like you, I take photos too. Am photographer for three groups. Check out my weblink if you so desire. Please keep up the blog about my hometown and show more of your quilts. Are you coming to the Kansas City Regional Quilt Festival. Here is one of my photos. https://www.facebook.com/kcrqf/photos/pb.215454825312383.-2207520000.1406241726./270195799838285/?type=3&theater Total billing is not out yet but sounds like there will be plenty to see, etc.